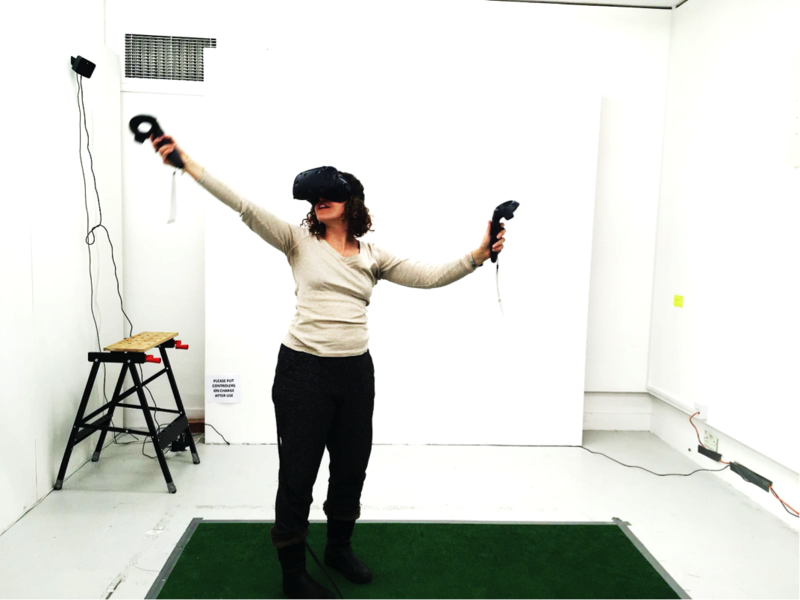 As part of Digital Maker Collective (DMC), a few members of ACE Connectors, Anna de Amicis, Emma De Angelis, Enrica Franca, Irene Del Principe and Jonathan Swain are taking their experimentation with Social Virtual Reality (VR) to Tate Exchange. At Tate Exchange, DMC wants to investigate Social VR through the lens of dance practices and movement in a virtual environment: a space where the elements that characterise the physical space are absent. In this phase of experimentation, DMC involved professional dancers, asking to perform and devise dance movements, both in the physical and in the digital space. This will give the opportunity to reflect on how movements, balance and interactions change when transposed into the virtual world and to which point these can be mirrored. Those involved in this project ask themselves how the key qualities of movement –balance, weight, volume, friction, scale – are challenged in the virtual space. Does our physicality change – and, with it, our state of mind? How do we share a space with another person when we are no longer working within the parameters of the physical space? How do we respond to each other’s movements in the virtual space?